Love everything about your Jayco RV except the mattress? Even on the high end models, standard camper mattresses can be thin and frankly just not comfortable to sleep on. Finding the perfect replacement to insure a quality night’s sleep is not as difficult as it might seem. At ReplacementMattress.com, we offer Jayco mattress replacements in a wide variety of styles and options to fit any model. Jayco offers camping trailers, travel trailers, toy haulers, fifth wheels as well as Class A and C RVs in a wide variety of styles and floorplans. The majority of Jaycos feature standard size trailer mattresses. Most travel trailers, such as the Jay Feather, Jay Flight and White Hawk, offer the RV queen short mattress (60” x 74”), while some of the models, such as the Eagle Fifth Wheel, are available with a king mattress (80” X 74”). Other size options may be full (53” X 74”) or twin (38” X 74”). Bunk mattresses come in a variety of dimensions ranging from 28” X 74“ to 42” X 80”. To assure a correct fit of the replacement mattress, it is essential that you obtain accurate measurements. We are happy to assist you in obtaining precise measurements for your Jayco mattress. Due to variations in sizes, measure the mattress platform, not the old mattress itself and round down to the closest inch. Measure the width, length and height of your existing trailer mattress. You might want to allow an extra two to three inches to accommodate your bedding, especially if your mattress is in an enclosed space. If your mattress has cut corners or radius corners, be sure to measure the number and location of the cut or radius corners. We can provide any RV mattress size and are happy to assist you in obtaining accurate measurements for your mattress. You can order mattresses with cut corners directly through our online shop, while you can use our custom mattress form to order a mattress with radius corners. Innerspring mattresses are generally not recommended for replacements in an RV, as the weight and bulkiness make them difficult to manage within the motorhome. Foam mattresses are the best alternative, they arrive rolled up and are much easier to manipulate and install in your camper. Additionally, there are several advantages to using foam mattresses in an RV. Whatever the size, shape or thickness needed, a foam mattress can be cut and customized to meet your needs. Look for a minimum of 1.8 density foam. 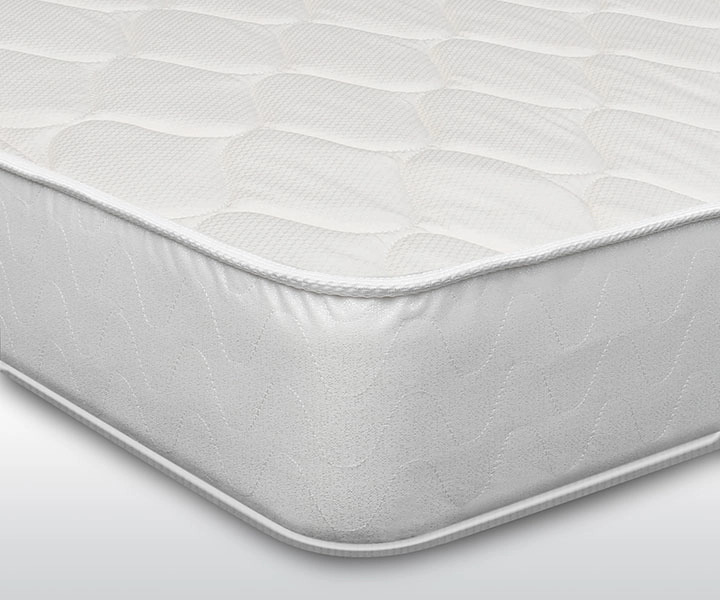 In regard to the softness or firmness of the mattress, look for an Indentation Force Deflection (IFD) of 23-26 (23= softer, 26=harder). For a plusher feel, choose a memory foam mattress. 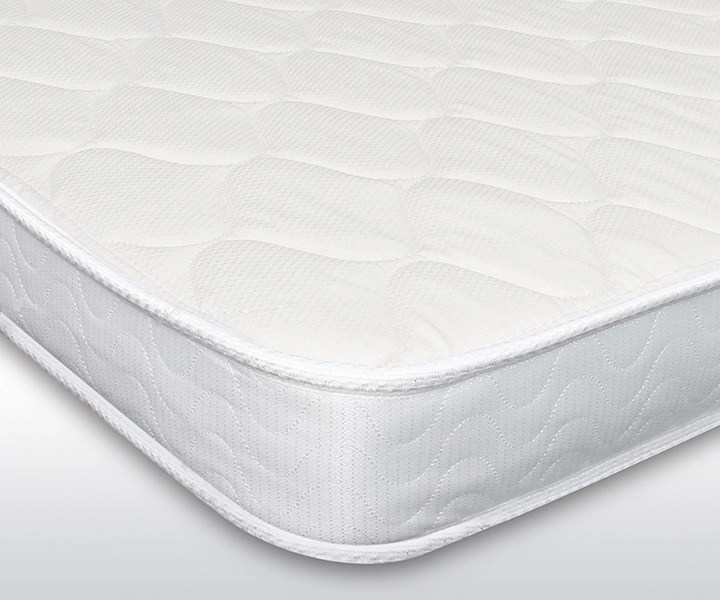 Memory foam is a top plush layer that is adhered to a support foam bottom. The support layer should be a minimum of four inches. Look for memory foam layers of at least two inches for the most comfort and a weight of two to four pounds. On the other hand, if you have a sleeper sofa in your Jayco and you want to replace the mattress then you need a sofa bed mattress, not an RV mattress (we also manufacture custom sofa sleeper mattresses by the way). Sofa mattresses are very different from camper mattresses, in terms of shape, standard sizes, thickness, and characteristics. Check out our sofa bed mattress buying guide to make sure you purchase a quality mattress, which will provide a good night’s sleep without feeling the bar! Be careful if you want to extend the length of your Jayco mattress (i.e. regular queen instead of short queen). Make sure you have sufficient clearance to accommodate the additional length or you may make it difficult to get around the bed. You may also have to replace or extend the length of your platform to hold a longer bed. Along the same lines, it you have a Murphy-style bed configuration, a longer mattress may not fit within the frame of your bed or have adequate clearance at the top. Hi Kris, if you have a 2016 Jayco Class C Melbourne with back slideout, the mattress can be done in 2 pieces, but the 2 pieces need to be different thicknesses, one 8″ and one 10″. Just to make sure, it would be for the best if you discussed with our customer care representative. I’ve sent you and email with additional details. Thank you for reaching out. We have a 2016 Jayco Class C Melbourne with back slideout. The current mattress is foldable. I am unable to locate a replacement mattress that is a queen short foldable. Can we use the regular queen short? Hi Martha, thank you for reaching out. We need more information to be able to answer your question. We’ll send you an email to clarify some aspects. Thank you! We own a 2005 – Jayco 27BH travel trailer. Unfortunately, it has been closed up for the season and is three hours away from our home. We meant to measure the bottom bunk mattress size, so we could keep an eye out for a new one, and forgot. Can you give me the dimensions of the bottom bunk mattress? Hi Brenda, thank you for reaching out. While we do carry all Jayco replacement mattress sizes, we’re not quite sure what dimensions the 2005 Jayco 27BH has and wouldn’t want to mislead you. It might be best if you contacted Jayco directly and asked them (you can do so here: https://www.jayco.com/site/contact/). Let us know if we can be of additional help.